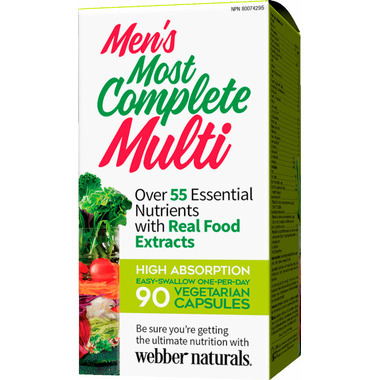 Webber Naturals Men’s Most Complete Multi is a one-per-day formula providing 100% of recommended vitamins and minerals in a whole-food base to maintain eyesight, skin, immune function, healthy bones, and muscle function for men under 50. Each easy-to-swallow capsule features over 55 nutrients from non-GMO sources, and is suitable for vegetarians. Recommended Dosage: Take 1 capsule daily with food, a few hours before or after taking other medications or natural health products, or as directed by a physician. Proprietary blend of: grape, pomegranate, strawberry, cranberry, blueberry, raspberry, bilberry (standardized to 76% polyphenols). Proprietary blend of: broccoli powder, daikon, red radish root extract, upland cress, cabbage, cauliflower powder, arugula, watercress, wasabi root. Proprietary blend of: cilantro, parsley, caper berry, artichoke, black radish root extract, dandelion root, kale powder, barley grass, celery seed powder, beet juice concentrate, tomato powder. Caution: Keep out of reach of children. There is enough iron in this package to seriously harm a child. Consult a physician prior to use if you are taking blood thinners. Hypersensitivity has been known to occur, in which case discontinue use. People sensitive to nicotinic acid may experience flushing of the skin that is generally mild and transient. Sealed for safety and freshness. Free of artificial colours, preservatives, or sweeteners; no dairy, sugar, wheat, gluten, yeast, egg, fish, shellfish, salt, tree nuts, or GMOs. Suitable for vegetarians. Canadian brand. The best Multi on the market right now IMO with Vitamin K2 that others just don't have & an excellent 1000iu of D3 all from Natural sources. I haven't taken a multi for over 15 years because it affects my stomach. I've been taking this vitamin with dinner for about a month, and experience no problems with my stomach or anything else. They're big, scary-looking pills, but surprisingly easy to swallow (sometimes I gag on an advil liquid cap). I like them and will keep purchasing. They're a good price for a once a day and for the fact they contain no sugar or soy and are suitable for vegetarians, make them a great choice. I did lots of research before deciding on these.